← Open Access: Who Pays the Copy-editor? There has been a fairly torrid debate over open access over the last six months (even longer for aficionados). For people who look in only occasionally it must seem like a storm that swirls around the same arguments time and again. This jargon can be problematic — open access is variously green, gold, gratis or libre — and is wrapped around a complex tangle of issues of freedoms, responsibilities, costs and opportunities that are debated passionately by advocates on both sides*. Cutting through this noisy argument is Peter Suber’s short book on the topic, which has just been published by MIT Press. In the ten brief chapters of Open Access he works his way through the definitions, the history, the economics and the implications of changes to the landscape of research publishing. The text is thorough, clear and measured. “I want busy people to read this book. OA benefits literally everyone, for the same reasons that research itself benefits literally everyone. OA performs this service by facilitating research and making the results more widely available and useful. It benefits researchers as readers by helping them find and retrieve the information they need, and it benefits researchers as authors by helping them reach readers who can apply, cite, and build on their work. OA benefits nonresearchers by accelerating research and all the goods that depend on research, such as new medicines, useful technologies, solved problems, informed decisions, improved policies, and beautiful understanding. I downloaded the Kindle version and worked through it in a couple of days’ commuting. I’d like to recommend that you do the same. Suber does a wholly admirable job of unpicking the complexities of open access and we’ll get there sooner if more of us are able to engage properly with the matter. *Update (5-7-12; 10:57 pm): Some interesting recent contributions to the debate have come from Keith Jeffrey (STFC), Stevan Harnad, and the Wellcome Trust. Update (18-6-13): And now, true to his principles, Suber has made the book open access you you can download it for free. This entry was posted in Book Review, Open Access and tagged kindle, open access. Bookmark the permalink. 2. Er. Does he mention the MFA flap in there? To do with OA in fine arts. That’s from 2008; the funny thing is I suspect many younger writers would, in this age of like-desperation, embrace OA as a publicity aid. Many writers would still roar at involuntary OA, though, so — and perhaps I’m wrong in this — the solution for institutions would seem simple, when considering OA for arts (and journalism): Ask, and structure it as opt-in. Reminds me of a conversation I had last week with a friend who’s in the chemistry department here: I was telling him about a new (and quite exciting) project, and noodling about how to fund it, at which he was dismissive, saying it wouldn’t be much. When I explained that if I’m gone for a month I’ve still got to pay a mortgage, childcare, etc., it dawned on him that I have no salary support. I’m a writer, not an academic, and I work entirely freelance. His whole face changed. He’s a tough guy, ex-military, and in nearly 15 years of acquaintance I’d never seen him look rattled, let alone scared. “No salary support” did it. And I still think that’s important in OA talk: it can be wonderful if your money comes from sources other than publishing. Ah – no that is not mentioned. There isn’t much discussion of funding distinctions between science and humanities, which I know is a concern. But I presume the green OA option remains open? Does Peter, in this book, perpetuate the literally useless definition of “libre” that he and Stevan Harnad came up with? I bow to no man in my respect for what Peter’s done for open access over the years, but this one bonehead manoeuvre has caused all sorts of difficulty and confusion. Libre OA: Access that is both free of charge (gratis OA) and free of at least some copyright and licensing restrictions. Because there are many possible copyright and licensing restrictions, libre OA is not just one access model but a range of access models. All the degrees of libre OA are alike in permitting uses that exceed fair use (or the local equivalent). Dammit. Yes, that is the useless definition. As you can see, “free of at least some copyright and licensing restrictions” tells you absolutely nothing of value. I could make a paper available gratis, and add permission to engrave copies on sheets of pure gold, and that would qualify as “libre”. It should have meant “BOAI-compliant”. As it is, it’s a worthless term, and it’s much better just to use the two terms “gratis” vs. “BOAI-compliant” and ignore “libre” completely. Well OK, but the example you give isn’t serious. The distinction at least calls attention to the evident deficiencies of gratis and my guess is that Suber favours a strong libre policy. What I appreciated about the book was that he is mindful of realities on the ground. Sure it’s serious. We know that publishers will call virtually anything “open access” when it’s no such thing by any meaningful definition. We know that they will use phrases like “fully open access” for articles that are not even close. Now thanks to this says-nothing definition, publishers can — and I am sure will — claim that they offer “libre open access” and invoke the name of Suber to back them up. Words matter. “Libre” should mean something. In the world of free software, which is where the term was taken from, it does. You cannot call software “libre” if you’re not free to copy, modify and redistribute it. The same should have been true of academic publishing. Instead the water is muddy, if not downright opaque. An uncharacteristic and very unfortunate misstep. Has Suber ever responded to this criticism? I don’t think the criticism has been made in public before. I have a 90%-written blog article that I’ve been meaning to finish since forever, which addresses this and various other issues of open-access nomenclature. I really ought to get it done. I’d like to know what Peter has to say. In that connection, let me reiterate that this mistake aside, I have nothing but respect for all that he’s done. Hi Stephen. Thanks for your kind words about my book. It’s the first.I’ve seen. Hi Mike. I’ve responded to this criticism many times, most recently in “The rise of libre open access” in last month’s issue of my newsletter. Most of the article is on other aspects of libre, but Postscript 2 addresses this particular terminological dispute. If the section were shorter, I’d cut/paste it here. I don’t think “libre” is a bad choice for “more free than gratis”. If you asked 100 randomly picked members of the FLOSS community for a term that meant “more free than gratis”, without priming the pump, I’d bet that most would offer “libre”. This is true; but it’s beside the point. If you asked 100 randomly picked members of the FLOSS community for a definition of the term “libre”, without priming the pump, not one of them would offer “more free than gratis”. So you took a term that had a 100% clear meaning in a community closely related to ours, and (with Stevan Harnad) gave a quite different meaning in our community. I don’t see how anyone can not see that as a misstep. If you really wanted a term that means “free to read and with some other unspecified freedoms that may or may not encompass the degree of freedom outlined by the BOAI” then the right thing to do would have been to make up a new term, not co-opt one that already had a different meaning. Well. There’s not much point arguing about this — we’re stuck with it. (I’ll leave you to have the last word.) The upshot is that I just don’t use the term “libre” at all, because it’s actively misleading, and I advise others not to use it either. I wonder why a book on Open Access, titled Open Access is not available for Open Access. Do you see the problem??? 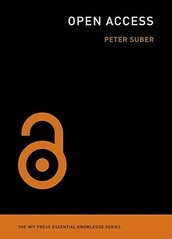 I’m sure Peter Suber can answer for himself but it’s worth pointing out that (1) many of his thoughts on open access are already available for free on the Internet and (2) the book will in fact be made open access 12 months after publication. Pingback: Peter Suber’s Open Access book is now available under an open-access license | O'Really?